Born poor. Doctor of Civil Law. Franciscan monk at age 22. Studied with Saint John of Capistrano. Disciple of Saint Bernadine of Siena. Tutor. Judge of sorcerers. Ordained in 1423. Preacher and evangelist throughout Central and Northern Europe, preaching every day for 40 years. Brought Blessed Bernardino of Feltre and Blessed Bernardino of Fosso into the Franciscans. Travelled and worked with Saint John Capistrano. Inquisitor in 1426, assigned to crush the heretical Fraticelli. Worked against the Bogomil heresy in Bosnia in 1432. Founded several monasteries in Bohemia, Hungary, and Austria. Chief almoner for the 1437 Crusade against the Turks. Worked at the Council of Florence in 1438 to re-unite the Eastern and Latin Churches. Papal legate in 1456. Preached against the Hussites in Austria and Hungary. The Dominican Inquisitors made him the subject of an inquiry in 1462 when they thought that one of his statements on the Precious Blood was heretical; Rome ordered the case to be put permanently on hold, and it was never settled. A skinny man who dressed in a tattered habit, he fasted every day until his health began to fail - and the pope ordered him to eat as a public service. Ninth of eleven children born to a farm family, and from an early age Catherine felt a call to the religious life. Never learned to read or write. Forced to take over running the house at age eight after her mother died and her older sister joined the Sisters of Charity. Worked as a waitress in her uncle's cafe in Paris, France. Upon entering a hospital run by the Sisters of Charity she received a vision in which Saint Vincent de Paul told her that God wanted her to work with the sick, and she later joined the Order, taking the name Catherine. On 18 July 1830 she had a vision of Our Lady who described to her a medal which she wished struck. On one side it has the image of Our Lady, and the words, "O Mary, conceived without sin, pray for us who have recourse to thee"; on the other are the hearts of Jesus and Mary. Our Lady told Catherine that wearers of the medal would receive great graces, it has become known as the Miraculous Medal, and its wearing and devotion has spread worldwide. Miracles reported at her tomb. Monk at the monastery of Saint Auxentius at age fifteen. Abbot of Saint Auxentius in 744. Retired in 756 to live as a hermit. Soon after, the iconoclast movement became very active in the area, led by Emperor Constantine Copronynus V. The emperor tried to enlist Stephen in the movement, but the holy hermit refused, and was exiled. Years later he returned, and to prove how important it was to respect icons and other religious art, Stephen went to the emperor, pulled out a coin that bore the emperor's likeness, threw it onto the floor, and stomped on it; as the emperor understood the importance of his own image, he imprisoned Stephen for 11 months. On his release, Stephen returned to the court and resumed the argument as though nothing has happened. He was ordered executed with more than 300 others who opposed iconoclasm. Educated from age 7 by Jesuits. From 1921 to 1926 he studied law and philosophy at the University of Valencia. While in university, he worked with Marian congregations. Began work as a lawyer in 1930. Married to Carmen Arteche Echeturia in the archdiocese of Valencia, Spain on 25 May 1933. General secretary of Catholic Action in Madrid, Spain in 1933. Father of one daughter. Widower in 1935. Martyred in the Spanish Civil War; he died with a rosary in his hand. Raised Catholic, but he kept quiet about it in public. Lifelong layman. Career soldier and officer. Worked to help the missionaries of the Paris Foreign Mission Society. In 1834 authorities discovered Andrew's Catholicism; he was stripped of rank and imprisoned for the faith. He was given the opportunity to gain his freedom by renouncing Christianity; he declined. Martyr. First century leader of the synagogue at Corinth. Convert, led to the faith by Saint Paul the Apostle, and mentioned in the opening of the 1st Epistle to the Corinthians. First bishop of Colophon, Asia Minor. Martyr. Educated at Cardinal Allen's college at Rheims, France. Ordained at Soissons, France. Returned to York, England to minister to covert Catholics during a period of persecution, using the name James Hudson. Imprisoned and executed for the crime of being a priest in England. Logothete (secretary of state) to Emperor Constantine VII Porphyrogenitus. Wrote history, prayers, letters, and collections of wisdom of Basil and Macarius of Egypt, but is most famous for his collection of legends and stories of the Byzantine saints similar to Blessed Jacopo de Voragine's The Golden Legend. An official torturer and executioner who murdered Christians in the persecutions of Diocletian. He was so impressed by the courage and faith of his victims, the women in particular, that he converted. Martyr. Dominican. Spent a long life preaching throughout Italy. When he was 90 years old and unable to climb into the pulpit, parishioners would left him into it so he could preach. Nun. Spiritual student of Saint Nilus the Younger. Abbess. Convert. Priest. Evangelized in Spain with Saint Saturninus, who had brought him into the faith. Martyr. Benedictine monk. Abbot and bishop of Saint-Claude, France. Fifth century senator. Husband of Saint Quieta with whom he was martyred. Wife of Saint Hilary, with whom she was martyred. 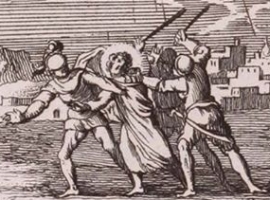 Martyred with his entire household in the persecutions of Diocletian. Sixth century abbot at Bangor, Ireland. A group of over 300 Christians martyred during the persecutions of the Iconoclast emperors. We have a lot of information on Saint Stephen the Younger, but for the others we have nothing but seven of their names - Andrew, Auxentius, Basil, Gregor, John, Peter and Stefan. A group of thirteen clerics killed or exiled in the persecutions of Arian Vandals in North Africa - Crescens, Crescentian, Cresconius, Eustace, Felix, Florentian, Habetdeum, Hortulanus, Mansuetus, Papinianus, Quodvultdeus, Urban and Valerian. A group of fourteen Christian laymen, deacons, priests and bishops who were martyred together in the persecutions of Julian the Apostate - Basil, Chariton, Comasios, Daniel, Etymasius, Hierotheos, John, Nicephorus, Peter, Sergius, Socrates, Theodore, Thomas and Timothy.